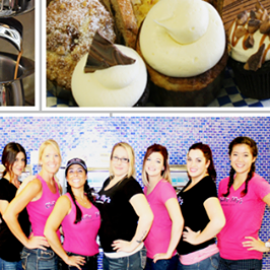 Chilly Jilly'z Bakery & Cafe has a new home on the edge of town in Boulder City, NV. The first building on the left as you approach town, and the last building on the right as you leave. Chilly Jilly'z offers a fun yet sophisticated environment where you can relax and enjoy a wide variety of homemade deliciousness. Start your morning off with one of our fabulous cinnamon rolls, breakfast turnovers, croissant, or various other bakery items ALL MADE FRESH DAILY IN OUR BAKERY. Wash your pastry down with a bold cup of our special Boulder Bean blended coffee, of gourmet espresso drink topped with one of our homemade whipped creams. Stop in for lunch and enjoy one of our many signature sandwiches, all of which are made with our homemade breads, also PREPARED FRESH DAILY IN OUR BAKERY. The main stays include Focaccia, Ciabatta, Sourdough, and now a roll also available with jalapeño & cheese. The BEST DAM PANINI is our #1 seller, Tri-Tip meat (also cooked on site free of any preservative or additives) served on our fresh Ciabatta topped with coleslaw & provolone cheese, pressed in our panini maker, and served warm with your choice of side, all of which are also made in house. 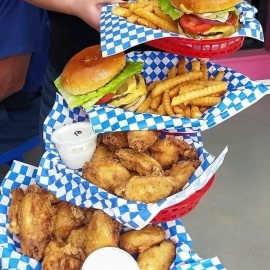 Don't forget about dinner, dine in, or drive thru on your way home to pick up your pressure fried tasty & AMAZING chicken. The meals are served with Broaster potato wedges, biscuits, and your choice of side (coleslaw, potato salad, macaroni & cheese, pasta salad, or a side of mixed greens.